Select Credits: Triumph of Love (Harlequin), Elegies for Angels Punks and Raging Queens, and Unidentified Human Remains and the True Nature of Love (David). Why theater? : I've never done anything else since the age of 2, and I would have it no other way. I don't think anything would be quite as fulfilling as this. Who do you play in The Immortal Coil? 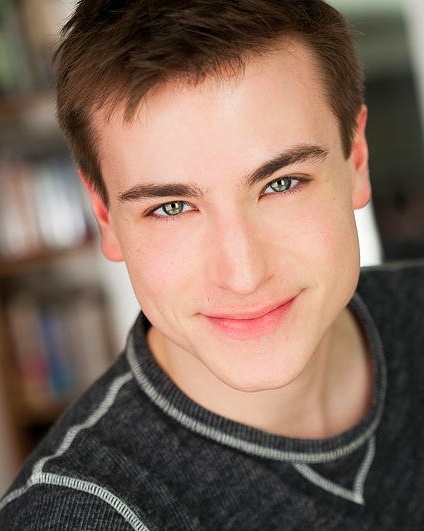 : I am Ketchum Harley, an adorably clueless, young, new actor. Tell us about The Immortal Coil: The Immortal Coil is a great new work by Jody Heaps focusing on the relationship between a young actor and his role model. It's an eloquent and hilarious script with some great moments of darkness. What is it like being a part of The Immortal Coil? : It's very collaborative! We always have a great time laughing and working together to make this a great piece! What kind of theater speaks to you? What or who inspires you as an artist? : I'm really loving this immersive style of theatre that became so popular with Sleep No More. It's just so alive and really transports you to another world. I love working on brand new plays, and watching the library of great theatre keep growing. Any roles you’re dying to play? : Anthony-Sweeney Todd, Miss Trunchbull-Matilda, Lord Farquad-Shrek, and I also have this passion to do an all male version of Nine in which I would want to portray the Claudia Jenssen role. What’s your favorite showtune? : "Unusual Way" from Nine, and "Johanna" from Sweeney Todd. I also can't stop singing "Last Midnight" from Into the Woods but I think we all go through that phase at least once. If you could work with anyone you’ve yet to work with, who would it be? : Hands down, no questions, Jessica Lange. Who would play you in a movie about yourself and what would it be called? : Kristin Chenoweth and it will be called "Legally Drunk: Red, White, and Bubbly". If you could go back in time and see any play or musical you missed, what would it be? : Definitely the original Cabaret, or Robert Preston and Barbara Cook in The Music Man. What show have you recommended to your friends? : I recently told a friend about the play The Memory of Water by Shelagh Stephenson. It's a great piece for women. Currently on Broadway, Fun Home is so beautiful and incredible. What’s your biggest guilty pleasure? : Totinos Pizza Rolls. What’s up next? : Auditioning! I always update my site www.Spencer-Wilson.com with what I am up to!